MIAA, the Manila International Airport Authority, plans to re-assign most airlines to other terminals. Originally scheduled for August 2018, the work has stalled. Be careful, this complete change of terminals can now happen any time. Please check with your airline BEFORE flying! Most airports in the world offer air-side bus transfer services or have special transfer terminals. Manila International Airport (NAIA) does not offer such services. Even worse, you are on your own to ride from your terminal to one of the 3 other terminals. In Manila you have to go through immigration. Please read our visa section! Then you have to fetch your luggage, pass customs and ride on your own to one of the 3 other terminals. You need at least 3 hours to transfer from one flight to another one. There are now free air-side transfer buses between the four terminals. All you need is a valid flight ticket on the same or next day from any other terminal. The International terminal is also known as Terminal 1 or NAIA-1. Most of the foreign airlines operate from this terminal. The PAL Terminal (Philippine Airlines) is known as NAIA-2 or "Centennial" and has a domestic and an international section exclusively used by Philippine Airlines. Terminal 3, NAIA-3, is operational since August 1, 2008. This terminal has a domestic and an international section and is still under construction. Cebu Pacific Air had been the first airline to move in. They were followed by PALexpress and some PAL flights. Recently some foreign carriers also moved to this terminal. These are two sections alongside Andrews Avenue and Domestic Road from where charter companies operate. See also our airport maps. The new NAIA Expressway opened on September 22, 2016. Transfer time is now decreasing. Full opening in January 2017. Still be careful with your planning. Count 3 hours for transfers in Manila. The time to move from one terminal to the other is one of most asked question. It is important to know the time you need to go from one terminal to the other. This knowledge prevents you from stress and wasted money. Typical transfer time from the door of the arriving plane to the door of the departing plane is 3 hours ! Don't try to do it with less connection time. Your incoming flight might be delayed and domestic airlines do not wait for missing passengers. Even worse, domestic airlines close their check-in counters 45 minutes prior to the expected flight schedule. The table shows you the travel time (in minutes) from one terminal to the other. 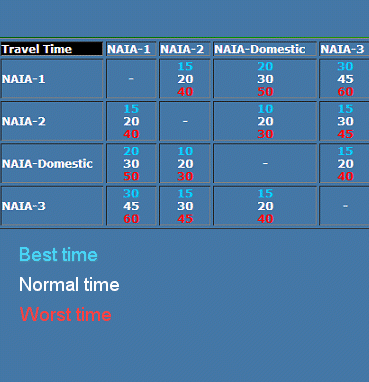 The travel time is indicated as best case, standard and worst case. We strongly recommend to set up your travel schedules using the worst case time. It is much better to have some time left than see a "closed" check-in counter. During many years the shuttle buses had to fight with traffic congestions on the public roads. Boat now these buses are driving inside the airport's fence. CAUTION: These buses are for transfer passengers only. You have to show your ongoing flight ticket. Transportation is free. The buses operate 24 hours. During day time every 30 minutes. From 11 p.m. to 5 a.m. it's every 50 minutes. How to find the bus stops of the shuttle bus? NAIA-1: Do not leave the terminal. On arrival level head to the extreme right hand. NAIA-2: Leave the terminal building and head right hand. NAIA-3: Do not leave the terminal. On arrival level head left and again left. NAIA-4: When entering arrival zone head immediately left hand. PAL, Philippine Airlines, offers an airside shuttle bus for guests transferring between PAL (terminal 2) and PALexpress (terminal-3). 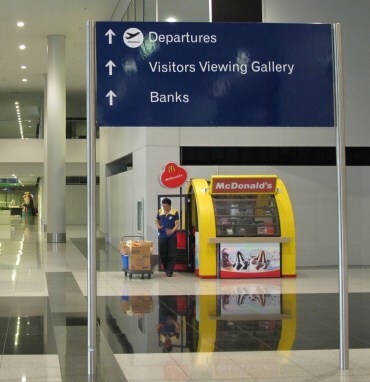 Look for the signs in both terminals, NAIA-2 and NAIA-3 or ask the PAL ground staff. This service is exclusively between PAL and PALexpress. If one of your flights is with another company, you have to use the standard shuttle bus or a taxi. There are now bus lines that connect the airport terminals with the nearest LRT/MRT railway stations. Passengers taking the Metro-Rail Transit line may disembark at the EDSA-Taft station. An airport shuttle terminal is located beside the MRT station. Those travelling by city bus routes may take a bus plying the EDSA-MIA route. These buses will pass Terminals 1 and 2, while a jeepney route can take you to Terminal 3. 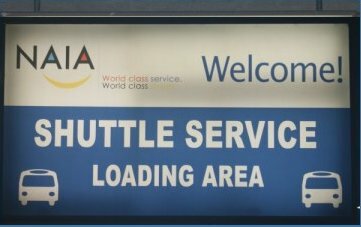 Additionally, you can take the airport shuttle service to move on to the different airport terminals. Read also our blog article about the new UBE Shuttle Bus System. There are 3 kinds of taxis at Manila's NAIA airport. The yellow airport taxis, the fixed rates coupon taxis and the common, mostly white, street taxis. Best are the yellow airport taxis. They are allowed anywhere in the airport. The cars are in good condition. They are clean and the aircon works. Usually you have no problems with the drivers. Flag down is PHP 70.00 including including the first 500 meters. Then the counter raises by PHP 4.00 every 300 meters or 2 minutes waiting time. The fixed rates "Coupon-Taxis" are also allowed anywhere in the airport. The cars are in good condition. But their rates are about 3 times higher than the ones of the yellow airport taxis. See also our Manila taxi information. The common, mostly white, street taxis are not allowed inside the airport's arrival. You only can get an arriving one on the departure level. But be careful! If the driver spots a "long-nose" (Caucasian), then he tries to sell astronomic fixed fares without meter. If you know the tariff, then you can negotiate - if not you might pay 20 times and more the standard rate. The rates depend on the waiting time. Without any traffic jam we had to pay PHP 74 to NAIA-2, PHP 86 to NAIA-Domestic and PHP 94 to NAIA-3. There seems to be no luggage hold in Manila's NAIA airport. But there are. In NAIA-1 and NAIA-2 you find a luggage hold near the baggage carousels on arrival level. In NAIA-1 There is only a little door and no sign. 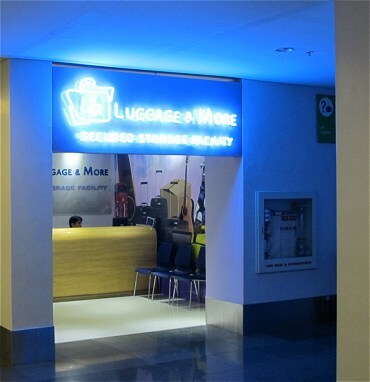 So when you are near the carousels, ask an employee for the Interline Baggage Room (phone: +63 2 877-1109 local 3633). NAIA-2 has an exclusive baggage counter for PAL passengers. It is the Central Baggage Services. The telephone number is +63 2 877-1109 local 2469. At this moment the fee is PHP 300 per day and per piece of luggage. We are not sure, where exactly this luggage hold is situated. Someones say that it is accessible from the landside others say that it is rather airside. We'll check next time in NAIA-2. NAIA-4, the "Old Domestic Terminal" offers absolutely no baggage service. The only real luggage hold can be found in NAIA-3. Luggage & More handles and stores your luggage for short and long periods of time. Located on arrival level, the Luggage & More facilities are covered by a 24-hour CCTV system to ensure the security and protection of all items left with them. Operating hours is from 6 a.m. to 11 p.m. daily. Baggage will under no circumstances be released outside the published operating hours. 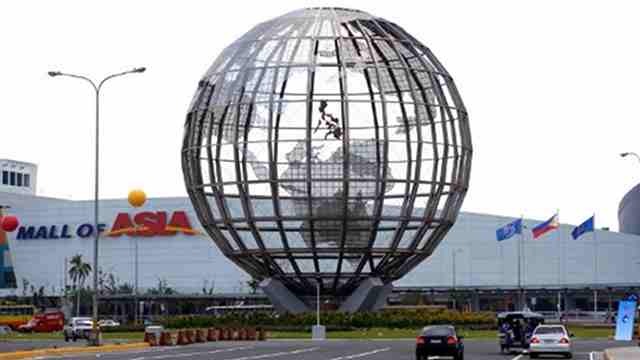 When you have a long connection time, 5 hours and more, then you might take a taxi to the SM Mall of Asia. This really big shopping mall has a free luggage hold which is open from 10 a.m. to midnight. There you also find a big selection of shops, restaurants and even movie theaters. The one-way taxi ride costs about PHP 150 and lasts some 20 minutes. When you have a long connection time, 5 hours and more, then you might take a taxi to the SM Mall of Asia. This really big shopping mall has a free luggage hold called Package Pick-up Service. This service is open from 10 a.m. to midnight. There you also find a big selection of shops, restaurants and even movie theaters. Taxi drivers coming from Manila's Airport (NAIA) can drive down the south wing end then turn right on the first intersection. 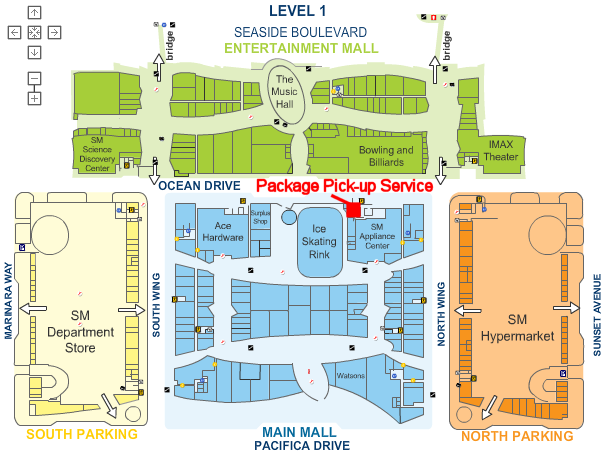 From inside the mall you can get easily to the Package Pick-up Service. Leave the mall at the Ice Skating Rink and then turn right. The counter is only a few steps away. The one-way taxi ride from NAIA to SM-MOA and vice-versa costs about PHP 150 and lasts some 20 minutes. Beware of the rush hours between 4 p.m. and 8 p.m. when you may need an hour for the same trip. The exchange rates at the airport are not so bad and the banks there are safer than the money-changers in the streets. There are bank offices in all terminals except NAIA-4. 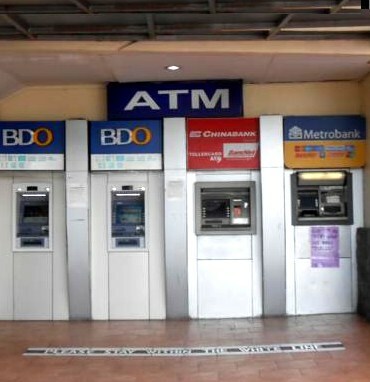 There are ATMs in all terminals except NAIA-4. Most ATMs accept also foreign credit cards with PIN codes. Please check the stickers on and around the ATM. 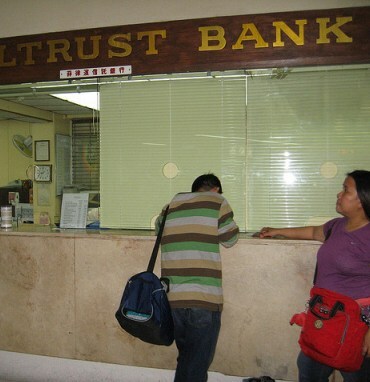 The banks may charge you PHP 200 for withdrawals using a card of another bank. If you need money in NAIA-4, then you may just cross over the road where several banks have their small branches. Overseas roaming tariffs may be extremely high. 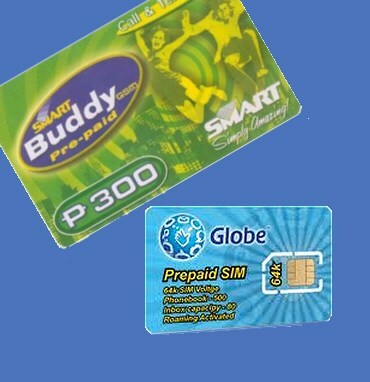 This is why we recommend to buy a cellphone SIM card from one of the two big local telecom companies SMART and GLOBE. The SIM card cost only PHP 40.00 and include already a load of PHP 25. 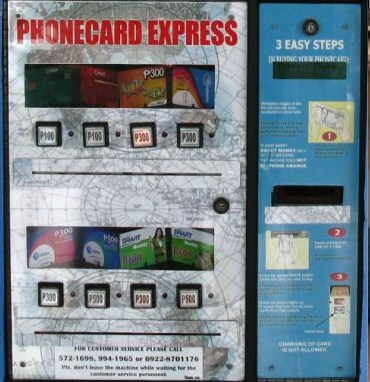 This cards are available at vending machines, at dedicated telecom shops and in nearly any shop. Prepaid load can also be bought at vending machines and shops. Some shops sell only "e-load". You give the shop-keeper your cell number and he/she loads the desired amount from her "load-wallet. CAUTION: Do not buy already used SIM cards. They might be expired or might have previously been used for unlawful actions. Check also the expiry date of the load or SIM card. An expired card does not load or work anymore. 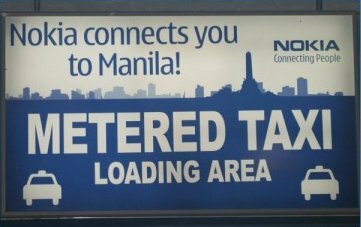 HINT: Prepaid loads in the Philippines expire very fast. A PHP 100 load expires after only 1 month. New load you get anywhere in the country. Read also our telecom page. Restaurants in Manila's NAIA airport? There is only one place that can be called "a restaurant". This is the "Window of the World" at NAIA-1. This restaurant is accessible from outside of the departure level. The prices are a bit higher than downtown Manila but they are far below of the prices in other international airports. 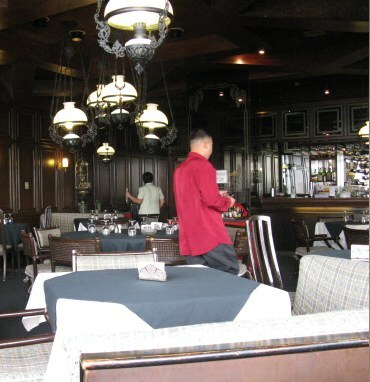 Staff is friendly and the choice of food satisfies Filipinos and foreigners. Inside all the terminals at Manila's NAIA you do not find one decent restaurant. There is a food court on 4th floor in NAIA-3 and there are food-stalls in all terminals. If you can live with fast food and finger food, then you will be happy. Update November 2015. The "Window of the World" restaurant is currently closed. Re-opening next year maybe! During many years people were complaining that there is no possibility to sleep in Manila's airport.Now there are sleeping facility and lounges inside NAIA terminals 1 and 3. February 27, 2016: We have to update this section because the NAIA-1 Dayrooms do now have their own website. Until now we presumed that these facility was a nice solution for transit passengers in need of a shower or a nap or both. it is DEFINE AS: a sleeping facility provided by the MIAA Authority as a temporary lodging for excluded (deportee and inadmissible) transit, and regular passengers (paxs)- these are categories of passengers who may check-in at Dayroom. It really seems that the NAIA-1 Dayrooms are rather an annex of the Bureau of Immigration than a friendly facility for transit passengers. We do not recommend to sleep in NAIA-1 Dayrooms! The 400 square meter facility on 4th floor of NAIA-3 is a "pay-per-use" space that people can access at the rates shown below. 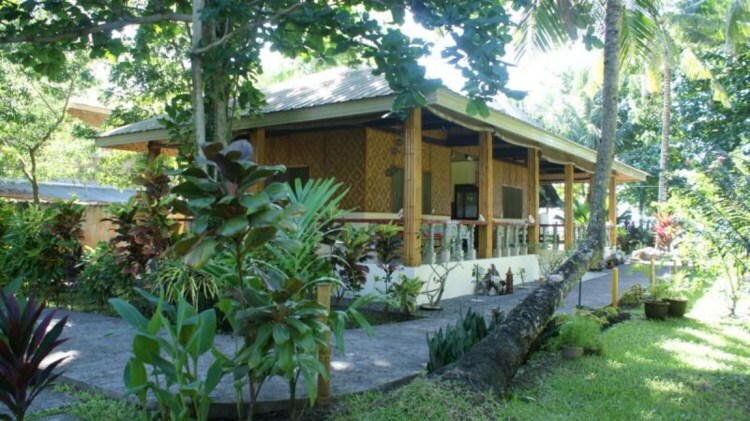 For PHP 500, guests can avail themselves of a 5 hours stay. 7 hours cost PHP 700. Guests have access to a free buffet, free WiFi, clean toilets and showers. The lounge offers 3 types of rooms for a nap or even a deep sleep. 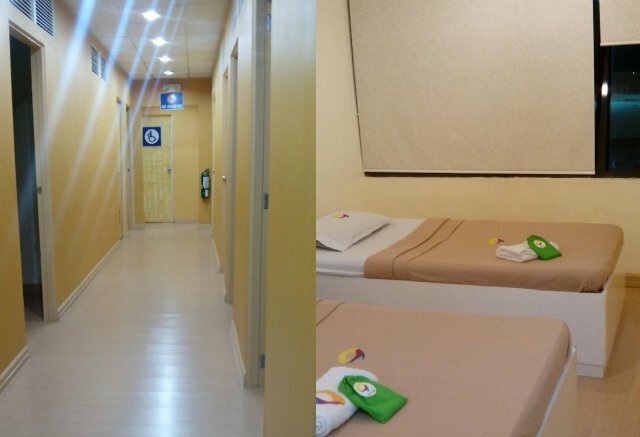 The cheapest are the capsule rooms wich cost PHP 1,000 for up to 7 hours. 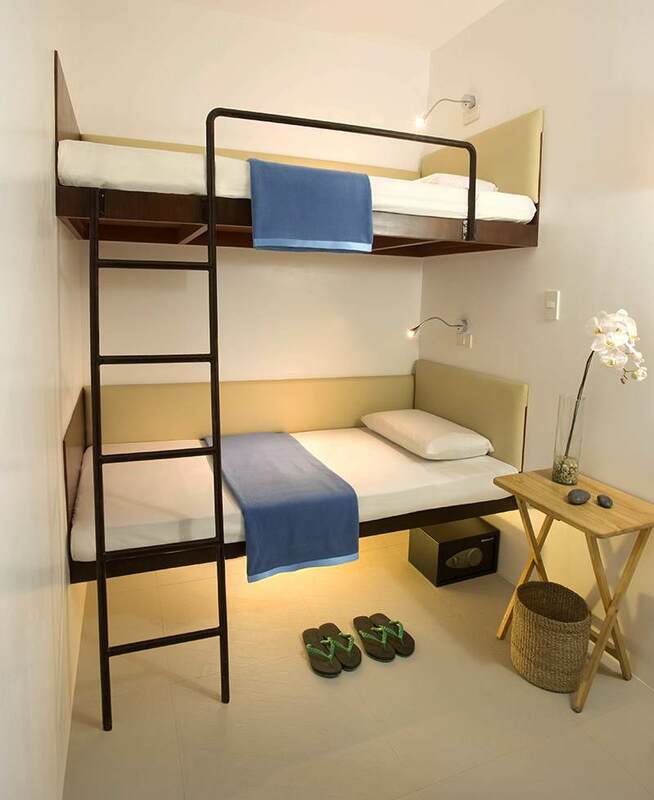 Next level are the Twin rooms at PHP 1,800 for up to 7 hours. The largest rooms are the family rooms with 4 beds. They are charged PHP 3,200 for up to 7 hours. The lounge's website for more information. We have tested this lounge twice on December 22, 2016 and January 9, 2017. Read our test report.